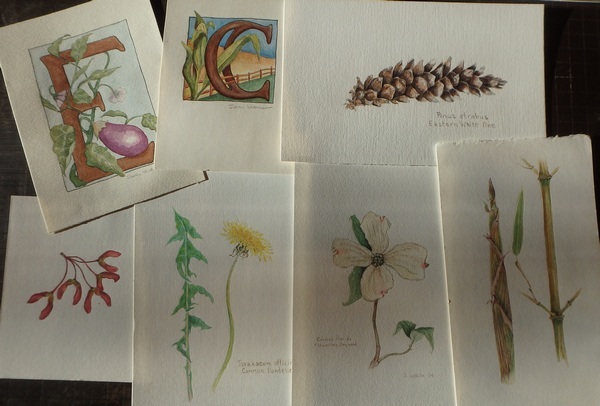 I used to do lots of these small Nature inspired drawings/paintings. On some I would put their identification. Documenting. I love documenting. Once it was on the paper and I knew what it was, I was satisfied. Simple straight forward work. Nothing here to think about. Just look closely and let your hand to the work. Wildflowers and dead birds. Some done from photographs, some from life. 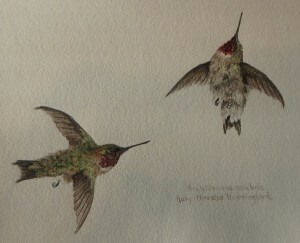 We actually kept the birds in the freezer if I could not draw them right away. I loved looking closely at all the parts and seeing if I could make the brush do the work. Some are done quite badly, and some not so bad. I saved them all with little idea of what to do with them. I turned to making a limited edition of calendars with some of them. These were printed on my computer and stitched together. Not many to sell and likely I just made enough to cover the cost of ink, paper and thread. Here is 2004. This book below I made about the same time. I had seen a flag book somewhere and found it such a simple concept. The movement was magic. 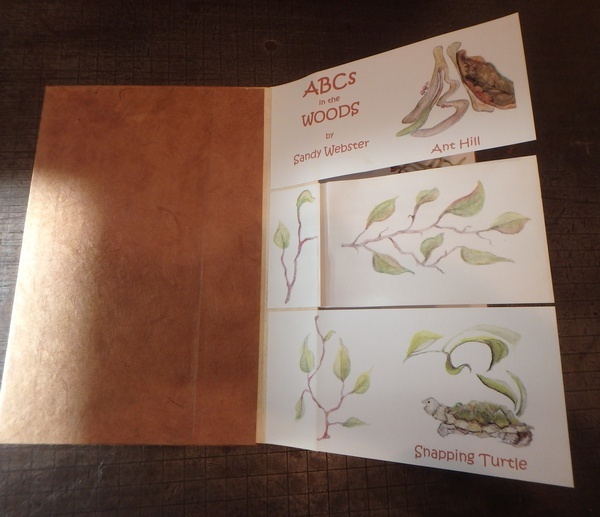 I thought I could do a series of children’s nature books using that format. I started with ABC’s in the Woods. Then I planned to move on to ABCs in the Sea, ABCs on the Farm. You get the idea. When I finished this one and showed it to someone, they said, “Did you know that Hedi Kyle made an alphabet book with her flag book design?” I did not. I did not even know that Ms Kyle originated the flag book design. I never exhibited the book anywhere and I was rather unenthusiastic about continuing with the series of books. I did make a few posters using my trusty Epson printer and sold a few, again barely covering the cost of ink and the over sized paper that was necessary. 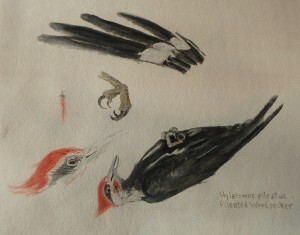 But I found the original in with my sketches and will show it below. 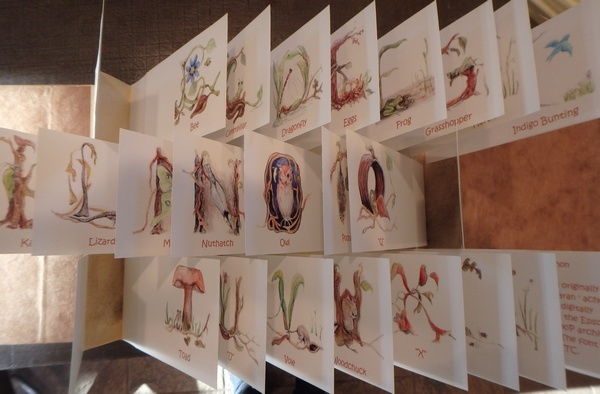 It was fun figuring out how to get the entire alphabet into that woods. “Q” was a rusted can with a leaf coming out at just the right angle, X,Y, and Z were patterns of plant life but the rest were all creatures in the woods. I think I will return to smaller works. Another piece returned yesterday from exhibition and now I have to do small repairs on it and find a place to store it. This might be my last year of doing any work that does not fit onto a page. I will seek out inventive ways to rid myself of the work coming back home. A small note here on the piece returned. I did it because it seemed like a good idea. The theme of the juried show was very interesting for me and I wanted to interpret it visually. There were several pieces entered and many did not make the cut. Mine did. The exhibit was up for one month. It cost me $50 to have it shipped both ways. The work had to be for sale and their take was going to be 40%, mine 60%. 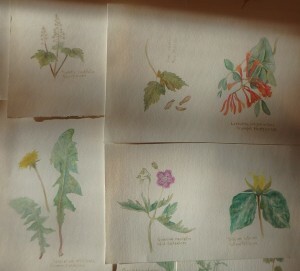 For some odd reason (maybe I had hoped it would sell) I priced the work at $400. Their take would have been $160, mine after shipping cost deducted would have been $190. The piece took two days to make when I add the hours up. I am keeping all this in mind as I return to the studio to mend the work returned and put together what might be the last of the kind of work that has so little return other than the shear pleasure of making. Let’s hope striking that match will be just as satisfying. Back in the Studio and Wondering What in the World?! There is a bit of snow on the ground. I am in and out of the studio. Working on ideas that take me to Lee’s shop to borrow his time and tools. 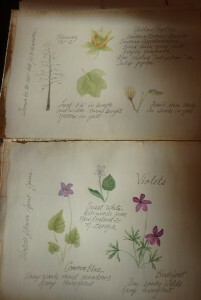 Cutting through books, using his torch, using my new burning tool, using watercolors from Australian soils. In the middle of several days just getting “to it”, I wonder just what is it I am doing. Is all this work saying what I want it to say? Am I wasting precious time on these things? And then I pass by the wine bottle fish hung over the holidays outside my studio window. 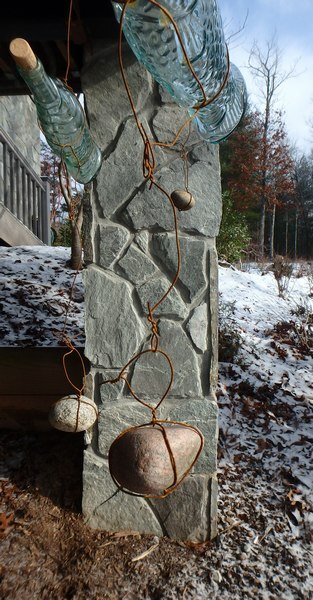 The light catches on them and their wires have all rusted and still hold the fish as they swim in the cool winter winds. 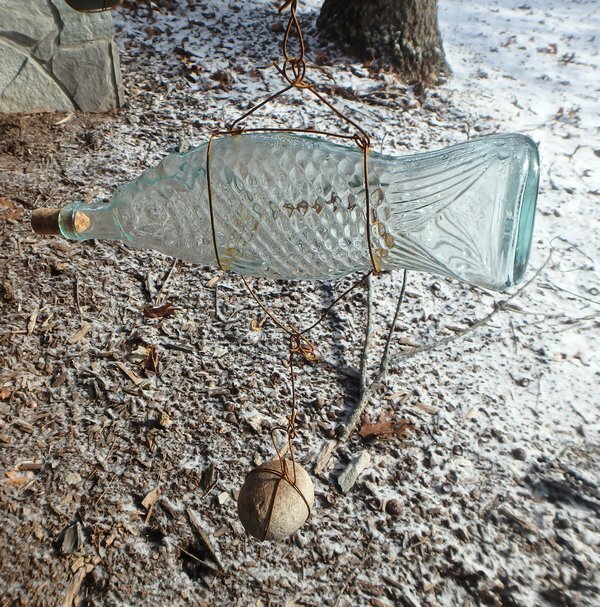 Then I think to myself that when I thought of doing this thing (hanging every fish wine bottle I could find under a porch with wire and rocks that were once a very long snake in the yard) I thought it might have been a dumb idea. But it is not. It amuses me. I like that my daughter and a friend helped with all that twisting of wires and hanging them just so. I had someone like that once and then not. Years later I wrote the following poem about that loss. You read while I go pick up the studio and pretend she is still here looking over my shoulder. often a comment, a look, a difference of opinion. making a hollow that slowly fills with wariness, distrust. 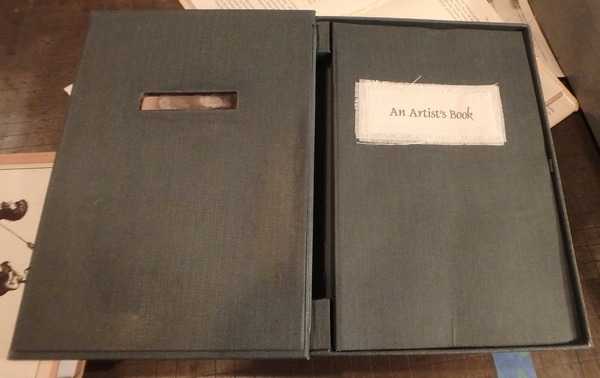 Sixteen years ago after finishing graduate school I made this box with a book on what it was like being an artist. This is the text found with images of work I had done. Work that took all my concentration and quite a bit of my time. The ideas for my art come from an enormous need to fix feelings into a visual form. It is never clear from the outset what that form will be. The feelings that provoke the work usually have to do with human connections and interactions. 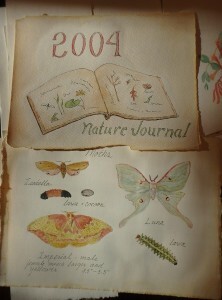 Sometime it is release enough to simply express myself in a journal entry. But here I can only pour out thought for myself. And unread or unsaid, it remains somehow unrealized. I might as well have just kept it inside. But to take the feeling through the studio and….. It is here that I can engage all my senses..
and lets me look hard at what it is that seems….. 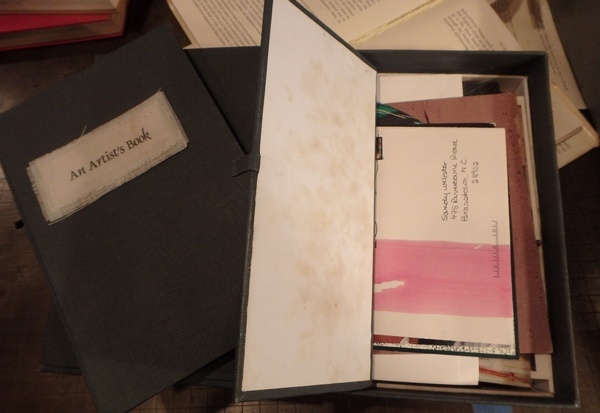 The box has an area near the spine that is filled with small bits and pieces that I found inspiring and necessary to include as objects with the book. 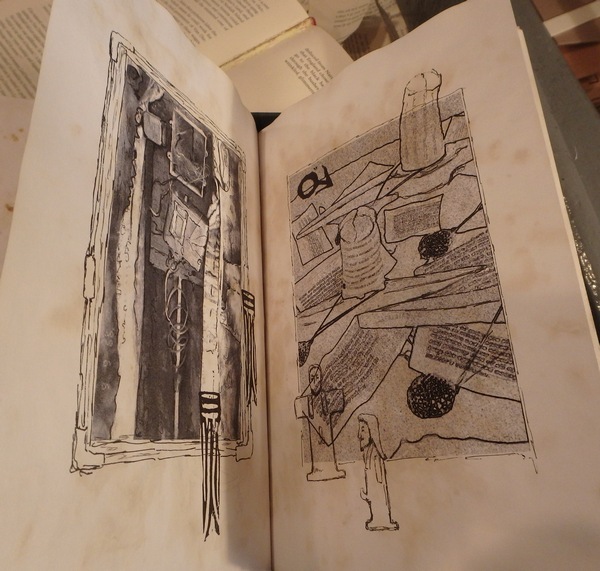 There are mica windows that are a bit rose-colored over the object and title of the book printed on cloth. (Cloth was important to so much of my work then). 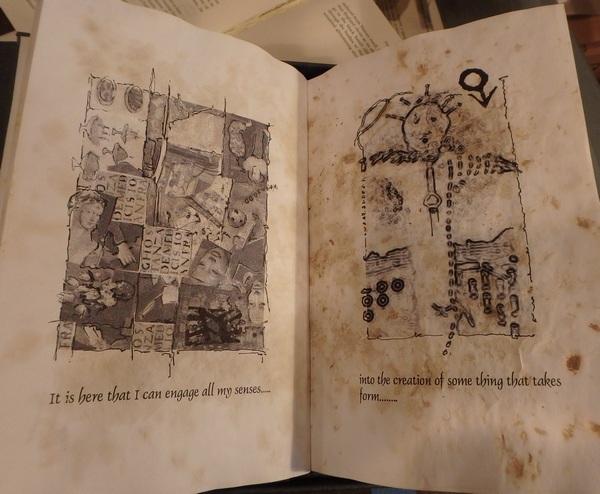 Under the book is a hidden compartment of letters from others about how my art affected them and what they saw in it at the time. And the inside title page of a book bound with skewers and made of papers that were stained with the wood chips from the scraps left by the men in work shops of my area. The men who inspired so much of my work back then and continue to make me smile at our memories. 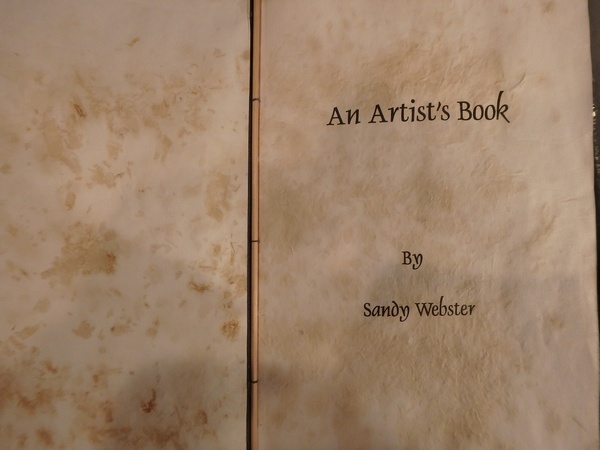 What I wanted to do with this book that was made as a gift to my children when I am no longer here, was an attempt to explain the preoccupation I had with my art, the time spent with the making of it, and the time neglected in other areas of my life. It seemed important that I do this, try to explain myself in some way. 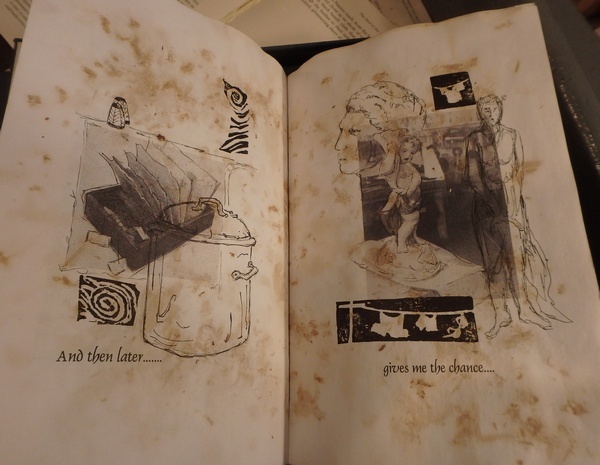 The images throughout the pages are of my artworks photographed and altered to fit the look of something not quite clear but very present. 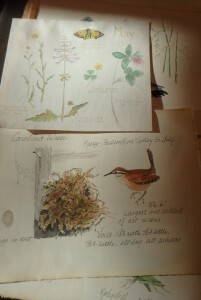 Then several of them were sketched over with pen and ink to emphasize the layers and complexities of my mind and hands and feelings about what I was trying to say with each piece. Looking at these pages now, sixteen years later, I find them fascinating and more evocative now than then. I really love this book/box. But what I love most is that I did it in the first place, that these things mattered so much to me that they be housed some way in a shrine of sorts. 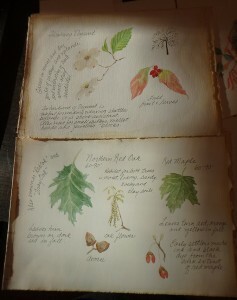 Here are some more of the pages. I think later today I will just sit with this book and feel the pages along with the memories of what inspired each image. And this page….it is like a piece of poetry waiting to be written. Before I head back into the studio to finish off this edition I thought it would be a good idea to show all the steps that go into putting it together. This is the finished book in a series of books based on my “weekly wait for food”. Every Sunday morning we go to a particular diner in our area and as soon as we arrive our waitress gives us coffee and our silverware wrapped up with a napkin in this napkin wrapper. I carefully remove the wrapper and can only tear it into a shape based on that years’ theme. I do allow myself to use the knife, fork or spoon as tools but find that the fork is the best for giving texture and poking an eye into something. The somewhat complex cover of the book for the diner series was discovered on an anthology of poetry book loaned by a friend. I liked how it folded and how both sides had to be printed exactly to get the windows to line up with an image. This appeals to an engineering side of me – making something fit. I photographed the diner’s buffet table and interior so I could adjust them in a free photo application downloaded onto my computer. Microsoft Publisher helps with the layout of pages and design. 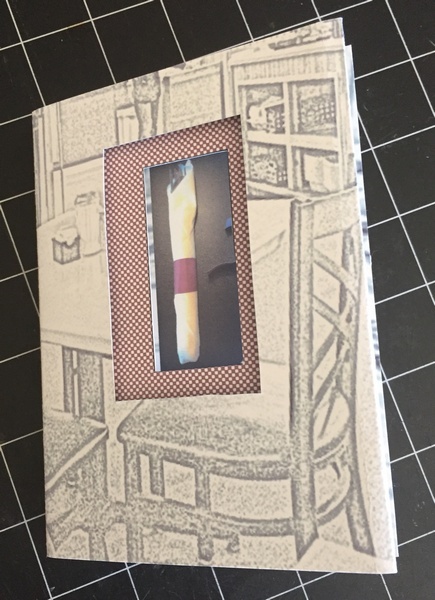 The cover has to be printed on my large Epson printer that will easily accommodate 11″ x 17″ card stock that will give me two covers inside and out when loaded properly. This is the fifth year of making things out of the napkin wrappers while waiting for my food. The first year was insects. That was fun, making bugs in a diner. 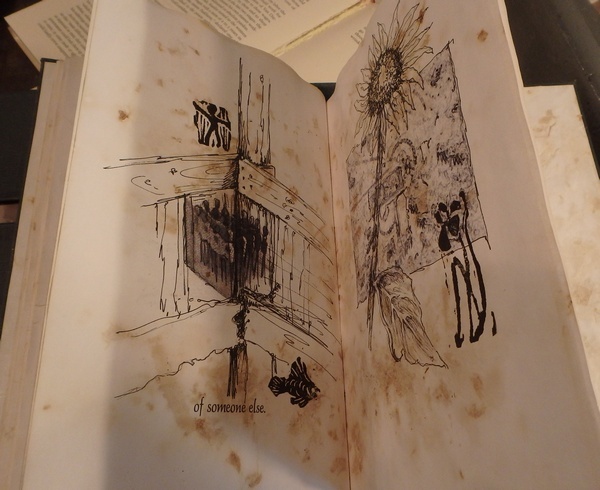 Below in an image of the center fold of that book with its own pop up insect. 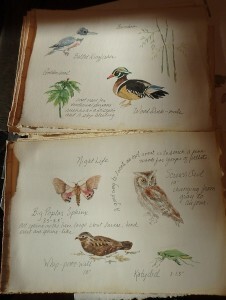 The only text in the insect book is what our waitress says to us. 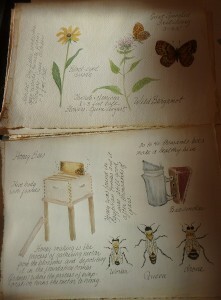 After insects came a year of garden guests, then sea creatures and then the circus. 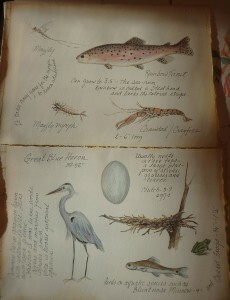 I did not do editions of garden guests or sea creatures. Well, not yet. I am tempted when I finish the circus book to go back to the sea creatures because I made a special one for my collector of these little artworks when his entire year of the sea creatures was lost with a six year old and the fire place. 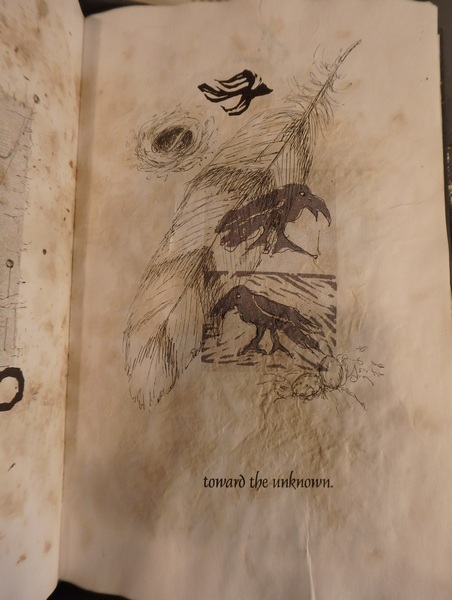 I made his one off book as compensation for his loss in a flag style book that sounded like waves washing in and out as the sea creatures moved back and forth. I can easily talk myself into doing an edition of twenty of that book. It too was fun. And of course fun is about all that comes from this work. It is expensive in ink and paper, let alone time. 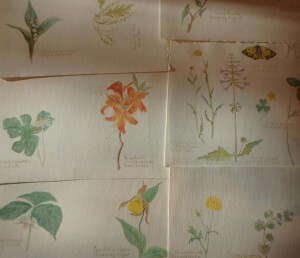 The insect book sold for $20 each and I gave away more than I sold. With the circus book I am raising the price to $35 and as of today have five spoken for. Let me start by saying that each Sunday when I make the “object” out of the napkin wrapper it is photographed on my iphone and then the piece is given to my collector who is amazingly grateful to receive these bits of scrap paper torn into something. Once in a while he will brave an attempt at something himself with his own wrapper and seek a critique. He is also my first purchaser of a finished book. Naturally I enjoy his enthusiasm. 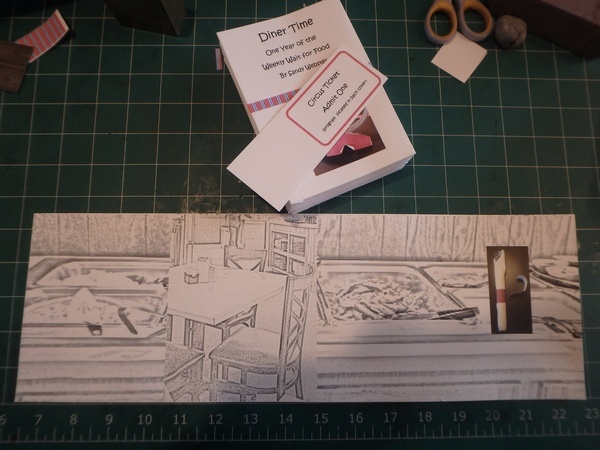 When we return from the diner, I re-size the photo and post it on facebook for those who are following Sandy Webster – Artist can see the latest in Napkin Wrapper work. When a year or 52 different pieces are finished I can start a new series and hopefully I have selected something that I can do 52 variations on that theme. 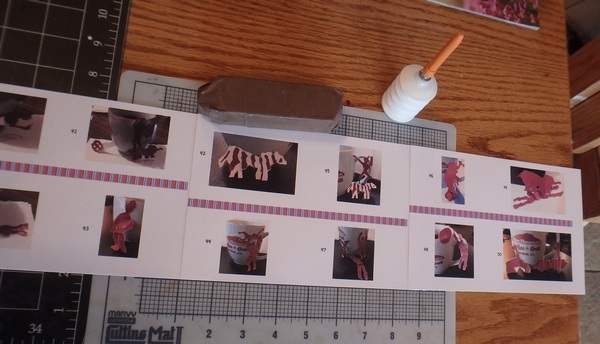 Here is how the circus book is being done step by step. To begin all photos have been re-sized to fit the pages and layout that must fit into the previously designed cover. 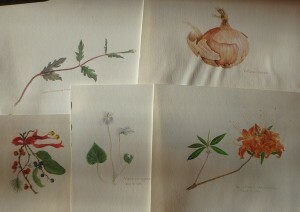 They are saved carefully until the entire 52 images have been used and pages numbered. 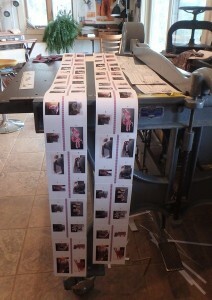 Then the printing. Here it gets fussy with ink and expensive. I need several cartridges to start the project. In the case of the circus book, the paper is card stock like the cover. 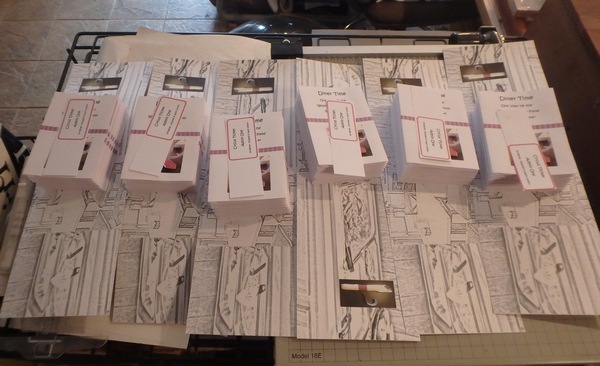 All paper from the same ream and all carefully loaded with the best side being printed on. 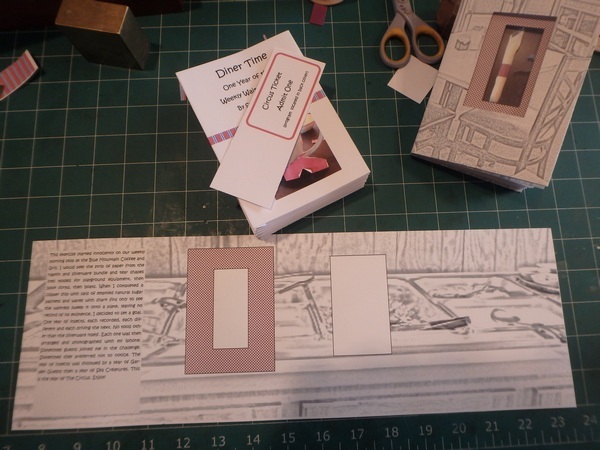 Then it is to the board shear to trim pages to the exact size and begin assembling. This very handy glue dispenser from MicroMark makes this job so much easier as a very thin bead of glue is needed to overlap the pages by only one half inch. Pages must be kept straight along a line and squared up to each other. 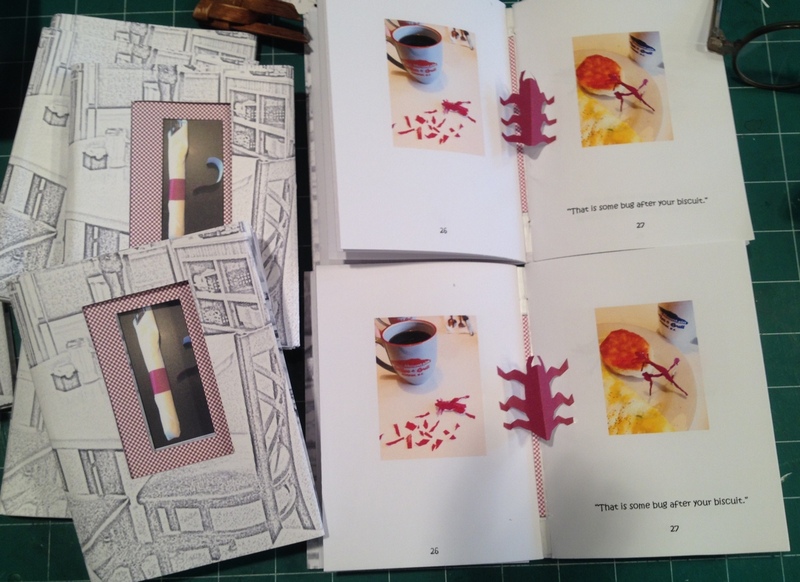 The whole book pages glued out is quite long and they easily fill the studio. After the strips of pages are dried I begin the folding process. 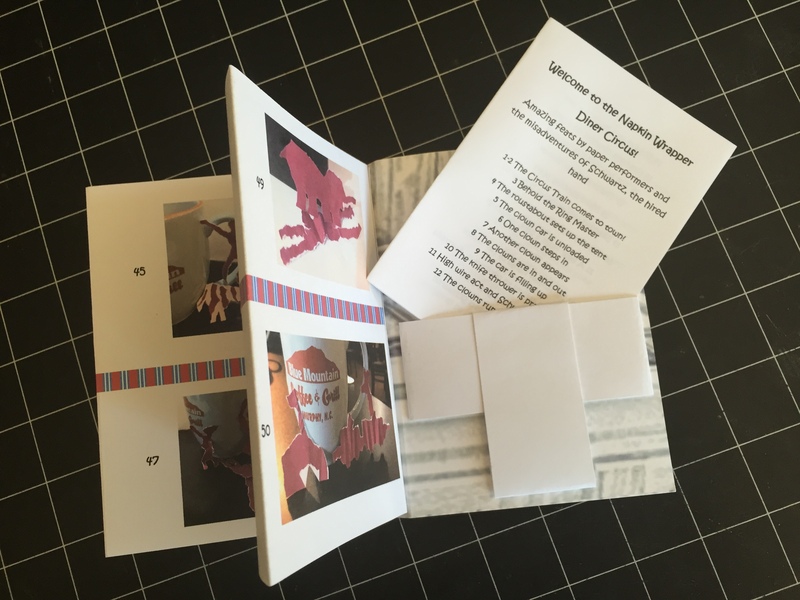 The circus book is an accordion style book that I want to be able to turn by pages or pull it completely away from the spine to give the feel of an active circus tent with lots going on at once. This again is precise work. 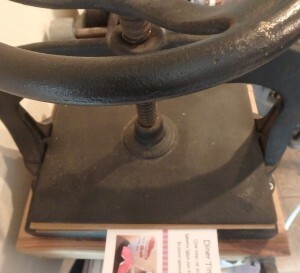 Then the book is put briefly into the press to crease the spine folds tighter together. 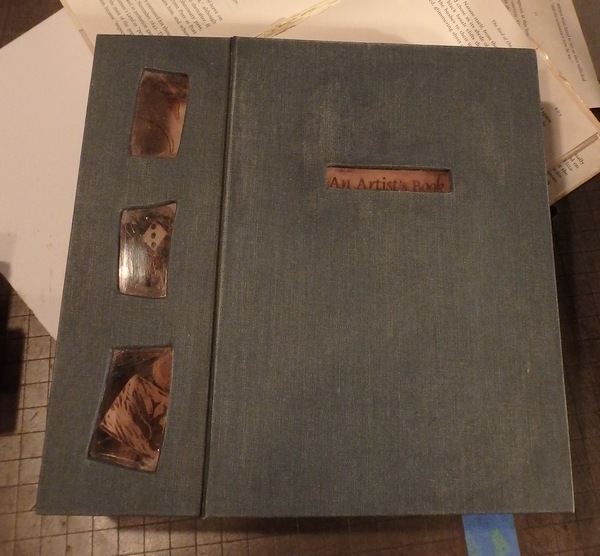 Then it is time to make the cover fit the text block and cut the windows in the cover. All cut, trimmed, folded and sized. 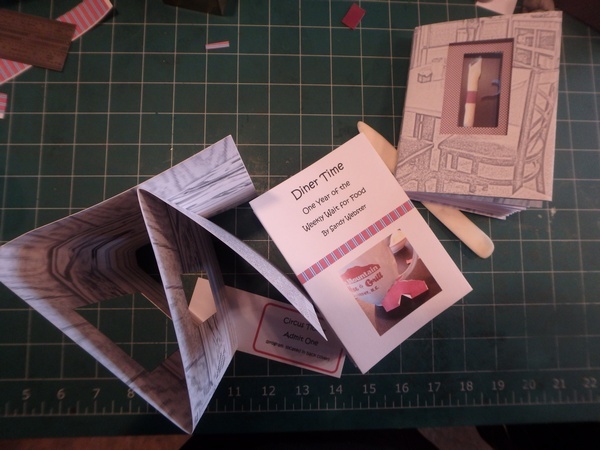 Gluing in the text block and pop up ticket. Then finally fitting in the program to a T strap inside the back cover. There are more of the edition of twenty to finish off. Is all this work and materials being compensated for in the price of $35 each? Hardly. But I do find making them so much fun and that is worth something. 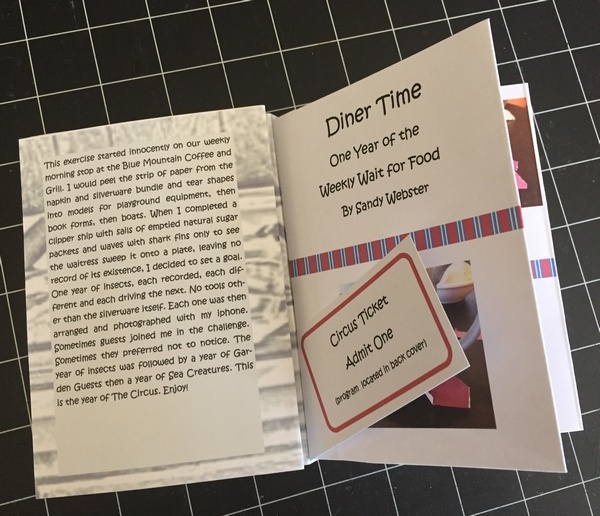 I will likely quit making these books about the diner wait for food when I go back to do the year of sea creatures. I can’t think of much that will be as interesting as these three variations on the diner books. At present I am tearing out dogs and so many of them look alike. They are a bit of a come down from the circus and I have no idea what will be next. Maybe I will just start a ball of napkin wrappers just to see how large I can get it. The thought of just sitting there with that napkin wrapper and doing nothing with it is just not a good idea. Wish me luck on selling more than five of these books!